This Simon memory game knock-off trains short term memory. Repeat the sequence shown. Watch the computer click the colored buttons then repeat the same sequence using your memory. 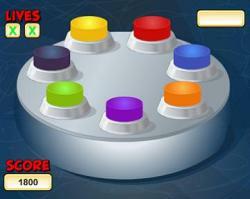 Watch the buttons light up and then click on the buttons to repeat the pattern. The pattern changes after each round and gets longer. If you like this game, you might also enjoy my Brain Sequencer and Copy Cat Jack pages. Click the lights in the same sequence as they light up. You need to be fast, so watch the lights closely. HOW TO PLAY. Three strikes and then you're out. If you miss a pattern, you get a new pattern, so don't try to do the pattern you missed again. This game quickly gets difficult, but it is a great way to increase the number of items you can store in your short-term memory. This is basically the same as the electronic Simon game that you may have played before. According to Wikipedia, Simon is an electronic game of rhythm and memory skill invented by Ralph H. Baer and Howard J. Morrison, manufactured and distributed by Milton Bradley. Have fun with this Simon memory game! Game distributed by ProProfs.com Used with Permission.